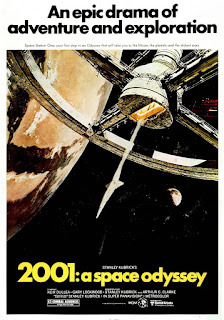 Once again we will be considering Stanley Kubrick's 2001: A Space Odyssey. Last time we considered it in the context of epistemology. This time I would like to consider it in the light of ontology. I offer a pair of ideas, the first via quotations from Thomas Aquinas (from his Summa Contra Gentiles) and then, from Nietzsche. In Kubrick's spirit of not forcing an interpretation of the film I will refrain from synthesis and merely offer these ideas as food for thought. L. For whatever is imperfect in a species seeks to acquire the perfection of that species. Thus, whoso has an opinion about a matter, and therefore an imperfect knowledge about it, for this very reason is spurred to the desire for certain knowledge about it. This immediate vision of God is promised to us in Holy Scripture: We see now through a glass in a dark manner; but then face to face. It would be impious to understand this in a material way, and imagine a material face in the Godhead. Nor is it possible for us to see God with a bodily face. Thus then we shall see God face to face, because we shall see Him immediately, even as a man whom we see face to face. It is through this vision that we become most like God, and participators of His blessedness, since God understands His substance through His essence, and this is His blessedness. Therefore it is said (I John iii.2): When he shall appear, we shall be like to Him; because we shall see Him as He is. LII. However, it is not possible for any created substance to attain, by its own power, to this way of seeing God. For that which is proper to the higher nature cannot be acquired by a lower nature, except through the action of the higher nature to which it properly belongs. . . Therefore no intellectual substance can see God through the divine essence, unless God Himself bring this about. If any two things have to be united together so that one be formal and the other material, their union must be completed by an action on the part of the one that is formal, and not by the action of the one that is material; for the form is the principle of action, whereas matter is the passive principle. Hence it is said (Rom. vi. 23): The grace of God is life everlasting. For we have proved that man's happiness consists in seeing God, which is called life everlasting. LIV. There should be proportion between the one understanding and the thing understood. But there is no proportion between the created intellect, even perfected by this light, and the divine substance; for there still remains an infinite distance between them. Therefore the created intellect cannot be raised by any light to see the divine substance.
. . . because it is not seen as perfectly by the created intellect as it is visible, even as one who holds a demonstrated conclusion as an opinion is said to know it but not to comprehend it, because he does not know it perfectly, that is, scientifically, although there be not part of it that he does not know. LIX. All the intellect sees in the divine substance, it sees at once. Hence Augustine says: Our thoughts will not then be unstable, going to and fro from one thing to another, but we shall see all we know by one glance. LXI. Therefore this vision takes place in a kind of participation in eternity. Moreover this vision is a kind of life, because the act of the intellect is a kind of life. Therefore by that vision the created intellect becomes a partaker of eternal life. . . The intellectual soul is created on the border line between eternity and time. . . therefore by this vision it enters into a participation of eternity. . .
For this reason our Lord says (Jo. xvii. 3): This is eternal life, that they may know Thee, the only true God. What of the man of the final scenes? What does he do? It is he who creates from the primordial soup or is it the monolith? Does he do everything or nothing? Is he creative or impotent? Is his final gesture one of supplication or resolve? Affirmation or negation? Clearly his final reaction to the monolith differs from the others. Is he the übermensch or the last man? Consider the title of the final act: Jupiter and Beyond the Infinite. Consider the use of György Ligeti's Requiem in the famous "Star Gate" scene. Who dies and who is born? Lastly, is the monolith ever comprehended by anyone in the film? Does it actually affect the characters or is the film about man's dialogue with this unknown? How does the final encounter with it differ? Is the scene of the star child birth or re-birth? For January 1 through February 25. 1) Interview: Violinist Janine Jansen. 2) Perlman Leaves Westchester Orchestra. 6) Beating Time: Just what is the role of the conductor? 8) Death's March: Can we hear the strains of mortality in the late works of classical composers? 23) The Doctors and the Divine: What do we learn when we diagnose genius? 31) Who's Afraid of an Amendments Convention? 34) Dambisa Moyo and Niall Ferguson on the "Eastern Challenge to Western Prosperity"
Written and directed by Preston Sturges. 1948. Unfaithfully Yours is a much odder movie than I expected and just why it works I am not precisely sure. Yet it does work and it is very funny. 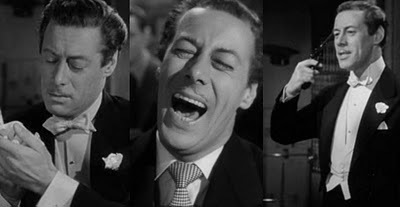 All of the performances are pitched nearly to the point of caricature, from Rex Harrison's cocky and stubborn conductor to Darnell's turn as his impossibly devoted wife to Edgar Kennedy as the music-loving flatfoot, the characters are at the edge of parody. This feature along with the dry and sharp wit which pervades nearly every line of the opening act, sets the audience slightly off-balance. Even the dialogue subverts our expectations and not just with sharp phrases. In the first few minutes Harrison switches between a semi-oratorical style and bizarre throw away phrases ("a cat who had its kittens in a harmonium.") We hear both musical jargon and rhyming jokes ("handle Handel" and "your Delius is delirious.") All of this dialogue is delivered with great rapidity further confusing the tone of this act as the film never settles into one tone. One the one hand we have some rather saucy dialogue (cut off with a few clever edits) and on the other we have giant cymbals and a fiasco with fire-hoses set to the William Tell Overture. 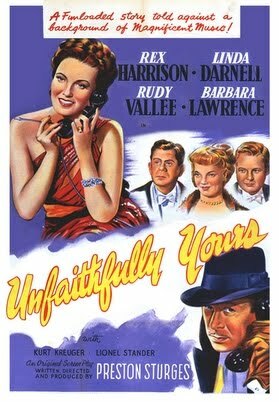 No wonder Unfaithfully Yours is sometimes billed as slapstick and other times dark comedy. What will we make of all of this? The grossly overweening Sir Alfred De Carter (Harrison) is quite the conceited conductor even before he suspects his new bride of infidelity. Afterward he is so simply and insufferably cruel and Darnell's reaction to him so honest and pained we have to wonder, again, what exactly we're supposed to make of this. This feels too serious to brush off with a few laughs. When De Carter finally takes the stage to conduct, he imagines what he might do to rectify the situation of his wife's affair and he contemplates his choices we enter into sequences in his imagination. 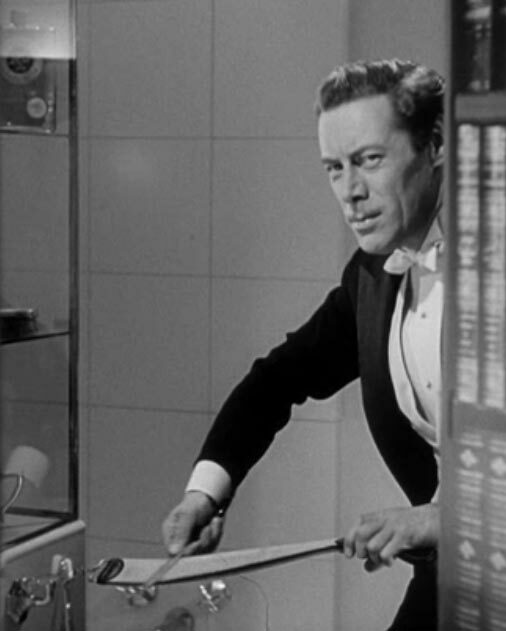 In the first scene the director plays the tone as if it were a murder mystery. Carter's wife is now wholly, and devilishly, complicit in her affair with Tony's secretary. For his revenge Carter executes a brilliant and elaborate set up of the two adulterers, offing his wife and framing his secretary for the deed. All set to the overture to Rossini's Semiramide he prepares the frame: dispatching his wife, sharpening the blade, and getting Tony's fingerprints on it. Carter orchestrates the crime to perfection so that one carefully timed phone-call from the lobby sets the events in motion to doom his secretary. The scene concludes with Carter enjoying a hilariously over-the-top cackle at Tony's trial. In the second sequence, set to the prelude to Tannhäuser and maintaining a melodramatic tone, Carter is resigned to the wandering of his wife's heart. He does not blame her but rather excuses her and even writes her a check so she can go off with Tony and be happy with him, free from want. In the final sequence Carter is manic, challenging Tony to a game of Russian roulette. Each scene matches the tone and tempo of the music and the concert hall serves as an effective point of departure. Now these stirrings of his imagination have so inspired Carter that he gives the greatest conducting performance of his career. . . from which he promptly bolts to try and setup the crime at his apartment. The ensuing string of mishaps is the lowest humor in the movie, a flurry of slapstick with running gags, a foot through a chair, and a pin in the buttocks, but Harrison plays it completely straight to hilarious result. Instead of orchestrating the masterful plot of his dreams he sits amidst the rubble of his room, mussed, foiled and struggling with the Simplicitas Home Recorder. The ultimate reconciliation with his wife, again set to Tannhäuser, makes a sort of coda to the film, and to continue the analogy the whole film's structure is rather musical. We get a sort of exposition of all the traditional styles of comedy with a hodgepodge of characters and tones. This gives way to three variations on a second act which played straight are not funny in themselves but humorous as contrasting resolutions to the plot. He then settles on a full-fledged slapstick finale before tying the plot and romance up with a coda. The couple's love, which we really have to take for granted since it is not developed, may serve only to tie the whole mess of things together. The coda too with its Wagnerian background and exaggerated romantic speechifying is far over the top. Again we must ask: what do we make of this? Is it a mess, uneven, revolutionary? This structure is more novel even than it appears due to how it unifies the highly disparate stylistic features of the movie and complements its character, and in this respect Unfaithfully Yours stands above other loosely structured comedies. The opening is a whimsical potpourri of styles, tones, and clichés. Only Carter's cruelty stands out too much. A normal film would have staked out its bounds and stayed within them to tell its story. You should need multiple films to contrast these styles but Sturges here with his "musical" structure fits them all in one movie. 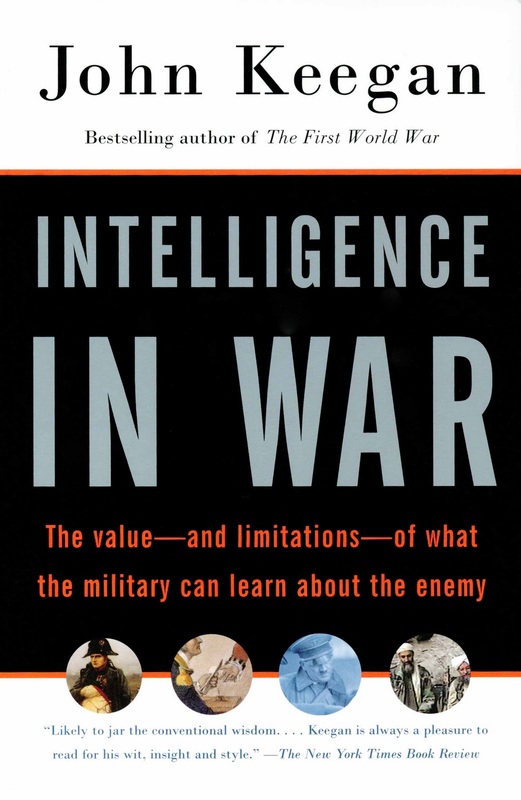 Intelligence in War: The Value–and Limitations–About What the Military Can Learn About the Enemy. "Intelligence is the handmaiden, not the mistress, of the warrior." The ten or so reviews on the cover of and in John Keegan's Intelligence in War all puzzle me a bit. The book is "witty," "wise," "well-written," and "sharp." It will be "an object of study" and it contains "expert [theorizing]." Too it is "fascinating" and filled with "drama." None said the book is persuasive, which I overwhelmingly find it. In fact after reading Intelligence in War Keegan's thesis seems self-evident. Yet it is often the case that the most simplistic observation or phenomenon requires the most detailed and careful study to explain. Keegan surely does this: Keegan's 349-page book is dense with troop strengths, sizes and locations, details about who knew what and when, and discussions of alternative explanations for every given phenomenon. Yet necessary as that research may be to Keegan's argument it is the axioms about war in general which stick in the memory and to which we return. This isn't just a book about how different commanders spied on their enemies, but a theory about what intelligence is and what it can, and cannot, offer the military. Keegan appropriately begins at the beginning which is a sort of lingo boot camp where we are introduced to real-time intelligence (rare intelligence on who knows what in sufficient time to make effective use of the news), strategic intelligence (knowledge of the character of the enemy, its size and capability, its dispositions and the nature of the terrain) and signal intelligence (captured enemy communications.) To these classifications Keegan adds a few caveats: 1) all intelligence is subject to its accuracy, timeliness, and the interpretation put on it, 2) the best intelligence won't help if the defense is too weak to profit by it, 3) intelligence is generally necessary but not sufficient for victory, 4) willpower counts for more than foreknowledge. Throughout Intelligence in War we will see these cautions play out from Napoleon to the Falklands, sometimes in great successes and sometimes in great defeats, in turns expected and surprising, in strokes of luck fortunate and disastrous. The first of Keegan's studies examines Lord Horatio Nelson's chase after Napoleon's Egypt-bound fleet in 1798. Commanded by Vice-Admiral Brueys and headed for Egypt with a convoy of nearly 300 ships escorted by his 22 warships the French fleet departed from Toulon on 19 May and Nelson planned to intercept. Unfortunately, the sea did not cooperate and a storm scattered Nelson's scout ships and damaged his own. Another obvious yet important maxim may now be observed: the sea is very large and it is very hard to find someone on it. With that in mind Nelson's task would seem impossible: reconvene with his fleet, track down the French fleet, and defeat it. The first task would have been easier had his captains followed his directions to sail at a particular pattern and latitude should they get separated. (In fact they did obey but broke formation a day sooner than Nelson's arrival, only one day beyond the stipulated instructions.) It was thus the situation that a scattered English fleet was seeking both Napoleon and each other. 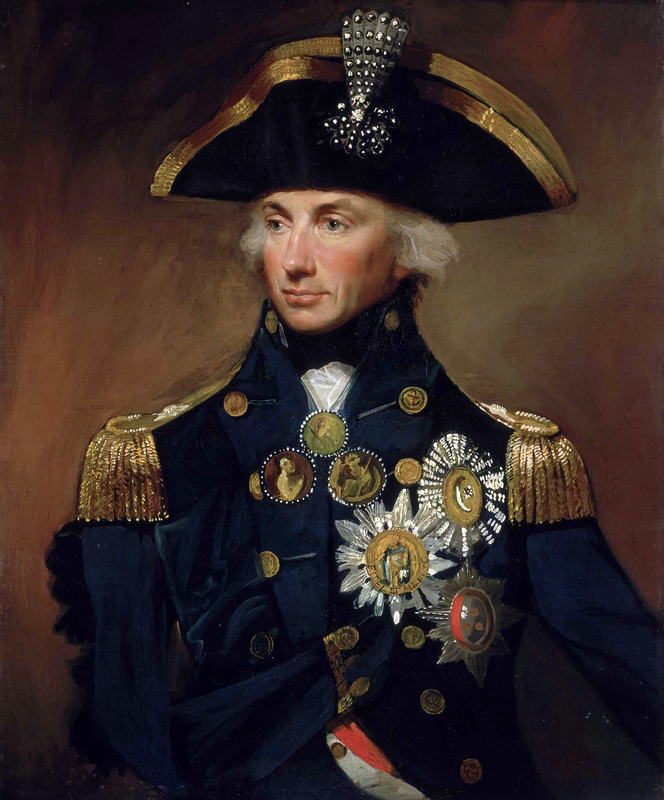 It is impossible here to describe the ensuing chase through the Mediterranean, but of the intelligence quest we must note that Nelson had to balance his original orders and the intelligence he first set sail with, partially incorrect intelligence from London (assembled from both contacts and the indiscreet French papers), counsel from his captains (which he deigned to take), gathered reports (often partially correct), and the general question of Napoleon's plan: if he was going to Sicily, Constantinople, or Egypt. Additionally Nelson faced the logistical problems of weather, communication (amongst his ships and with London), and mistakes by both himself and his captains. To note only such is still to put aside the cunning of the enemy himself, who used disinformation in the official press and commandeered merchant ships to deprive Nelson of fresh reports. Despite several near misses Keegan counts this not just a resounding victory for Nelson at the Nile, but an intelligence victory. Having lost the French fleet it was bound to take time to find it again and Nelson overcame all of these obstacles, slowly gathering reports, weighing probabilities, scoping out potential targets, and narrowing down the possibilities. Keegan's summary of the situation as Nelson would have seen it, i.e. with all the possibilities based on his information (correct and incorrect), is tremendously insightful and making us wonder: how did he pull it off? Who could? There seem to be simply too many variables and gaps in information. It was not ultimately any given piece of intelligence which turned the tide but throughout the chase it was Nelson's dogged pursuit, his relentlessness, extreme focus, strategic grasp, and operational innovation which allowed him to recover from mistakes and erroneous reports and rule out alternatives. Important too is that Nelson was free from London to make his own judgments. Finally at the Nile, Keegan writes, it was ultimately the killer instinct of the British which accounts for their spectacular victory. Whereas Nelson was on the French fleet's tail in the Mediterranean, the task of Stonewall Jackson in the Shenandoah Valley was to "mystify and mislead" his enemy. Here too the terrain and available means of communication play integral parts of the story. The South was materially weak but geographically strong and the Shenandoah Valley could be used either defensively or offensively. Jackson elects to use it defensively and attempts what seems the impossible: to keep the 160,000 union troops spread out across Virginia pinned down and separated and to make Lincoln think an attack on Washington was possible at any time. Throughout the campaign Jackson would have to balance keeping Union General Nathaniel Banks within the valley, 2) avoiding the Union forces to the West, and 3) keeping open his line of withdrawal to Richmond. Jackson's task absolutely required him to wage a mobile campaign, but to do so he would need to out-maneuver Banks in the valley and monitor all movements inside and around it. Offering invaluable aid in this endeavor was the mapmaker Jedediah Hotchkiss who provided Jackson with accurate maps of the valley. The Shenandoah, with its different names for the same place and different places with the same name, its rivers, mountain passes, and railways, would prove vexing for the Northern generals who lacked firsthand knowledge and even maps. Keegan's account of the brilliant Jacksonian campaign of misdirection and diversion is as detailed and gripping as Nelson's tale and equally revealing about both the general's mind and the quality of his troops. Jackson had to contend with the positions of many Union generals as well as provide the needed support for Lee and Johnston. While he had the assets of Hotchkiss and his maps, interrogation reports, and local intelligence (something Brueys had deprived Nelson of) Jackson suffered from incorrect intelligence too: on 25 May 1862 Jackson came upon Banks' men from behind, not ahead of them as his intelligence predicted. As such he could not cut them off from Harper's Ferry and Banks was able to withdraw, Jackson's cavalry under Ashby being off one of Ashby's rides. (Let this occurrence not obscure the fact that Ashby and his cavalry screened Jackson's movements from Fremont and Banks with terrific efficiency.) Too Jackson's first encounter with the Union army in the Shenandoah a month earlier was an outright mess as Jackson was to learn, contra his intelligence, he was outnumbered 10,000 to his 4,000. Jackson, though, made outstanding use of his intelligence. First was his understanding of his enemy, Banks, whom he correctly perceived to be a political general, not a soldier. Too he knew that McClellan was a procrastinator and would ask for more troops, allowing his enemies to strengthen their positions. Jackson made use of his constantly refreshed intelligence from Hotchkiss and reports from the friendly population to move quickly through the valley. So fast, in fact, his infantry was dubbed, "Jackson's foot cavalry" as they were able to march as long as horsemen could ride, and barefoot, for dozens of miles. With his speed and knowledge of the terrain he was able to calculate the uncertainties of his opponents, often many moves ahead, and draw them in or avoid battle in order to take it on his terms. 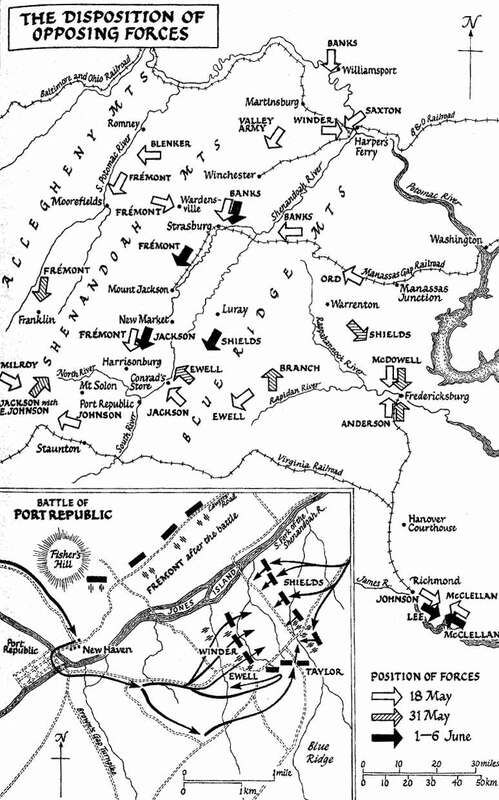 Jackson was able, then, to paralyze the larger forces with his much smaller one until he eventually drove the Union from the field at Port Republic and liberated Richmond. The biggest surprise at the advent of radio communication is what does not change in naval warfare. Keegan makes his point in three short stories from the First World War. Yes the Nelsonian era's Home Popham semaphore system gives way to the Morse ciphers over radio without delay, but radio silence was imperative to keep your location a secret, thus when drawing out ships for reconnaissance the distances were, in the 20th century, still at line-of-sight. Thus in 1914 with Kaiser Wilhelm's imperial project underway and after the buildup of their navy over the last fourteen years under Admiral von Tirpitz, the German navy, though it could not defeat Great Britain in its home water, could harass the vast British fleet of 8,500 merchant ships in the Pacific. At the time, the British did not protect their merchant fleets with convoys. The flaws in the British strategy here are many but chief among them, besides the mistake of not providing convoys for their merchantmen, were 1) their attempt to work a worldwide strategy without using their best ships, 2) Churchill (then the Admiralty's political chief)'s war on the North coast of Belgium, and 3) Rear Admiral Sir Christopher Cradock's impossible task of both protecting British trade in the Atlantic and waging cruiser war in the Pacific. The intelligence aspect of Cradock's embarrassing defeat 1 November 1914 at Coronel (off the coast of central Chile), Britain's first naval defeat since 1812, can be summed up in brief: his opponent, Vice Admiral Graf von Spee only used one of his ships' wireless, hiding his numbers. The search for the German cruiser Emden is one of the most famous in naval history. Lieutenant Commander Karl von Müller had been made commander of Emden in 1913 and with a combination of luck, cunning, and skill, captured fourteen British merchant ships in the Indian Ocean. Duly celebrated by those under his command he was also widely remembered as a "Gentleman-of-War" for his successful efforts to minimize civilian casualties and policy of sending captives away. Müller's success and safety laid both in his firm observance of radio silence and in the vastness of the sea itself. Churchill's cruiser sweeps, of eight ships again still separated by the limit of visual range, could scarcely hope with their paltry range of 12 miles to find Emden in the 3,000 mile wide Pacific. Yet Emden's success was not infinite and though von Müller observed radio silence it was his insistence on destroying a communication outpost and adding to his ship's laurels that caused its downfall. Upon approaching Direction Island the islanders got off a message, "SOS Emden here." What von Müller did not know was that the SOS was to the HMS Minotaur, a ship Emden knew was not far but had assumed was steaming to Africa to deal with a Boer uprising. Having misinterpreted the location and direction of the Minotaur von Müller unwisely ignored the SOS the islanders got off. The Minotaur radioed the Sydney which showed up at Direction Island just as von Müller was expecting his Buresk. As Buresk and Sydney looked alike at a distance, von Müller allowed Sydney to get regrettably close, where she shot Emden to pieces. Wreck of the Emden, November 1914. Despite the complexities as to how the German taking of Crete fits into WWII the Cretan example to intelligence is a straightforward one and important one: intelligence is only as good as the interpretation put on it. As a corollary one might add, "the interpretation is often best supplied by the intelligence officers who gather it on a daily basis." By 1941 Enigma was being cracked in real time and the defenders of Crete possessed the timing, objectives, strength, and composition of the German paratroopers which were to land on Crete. Too the British Commonwealth forces numbered 42,460 to the expected 22,040 expected German. What more could you ask for? Yet Bernard Freyberg was at a tremendous disadvantage at interpreting the intelligence. He had no expertise in dealing with Enigma and interpreting the decrypted signal intelligence, yet having heard of Enigma but three weeks before the German attack he was forced to make operational decisions from the sigintel and without the benefit of any second opinion or advice. Why would Freyberg expect anything other than a sea-based assault: in all of history no island had ever been captured except by sea-invasion and likewise the Germans were challenging British sea authority elsewhere. In explaining Freyber's situation Keegan quotes Ralph Bennet, the "authoritative historian of the Ultra system and himself a wartime Bletchley analyst" who concludes that while Freyberg may seem to have been foolishly preoccupied with a sea-attack, his apprehension about one, "can only be faulted by an abuse of hindsight." [Keegan, 171] One does not simply study raw Enigma decrypts and make decisions based on them, they need to be woven into a pattern intelligible to a commander. Admiral Chūichi Nagumo's reconnaissance plane leaves late due to mechanical difficulty. The sky is spotted with clouds. Nagumo changes direction and a group of Hornets is intercepted by 60 Zeroes. The Hornets are lost but the fight brings down the Zeroes from the height they should be at to protect their carriers. More American aircraft follow and take out the four unprotected Japanese carriers. Then the U.S. submarine Nautilus sails astray and attracts the attention of the Japanese fleet, from which one destroyer breaks off to give chase. U.S. planes spot the Japanese ship's wake and follow it back to its fleet and report the Japanese fleet's position to American commanders. In a matter of hours Nagumo's situation is radically altered. Too in Nagumo's tactics we see familiar fatal flaws we saw in Jackson's enemies and Cradock's orders: 1) he simply was not trained to think in terms of the speeds and distances necessary to adapt, 2) he had two obligations he could not equally meet: defend the landing force and draw the U.S. Carriers in to battle. Frustrated by his intelligence, Nagumo dithered, unsure which effort to prioritize and attempting to do both. Backed up by Rochefort's intelligence and without the luxury of indecision the American commanders went all in with their attacks. "Intelligence did not win the war, but it shortened it." Keegan's sections on the breaking of the Enigma and the Japanese Purple the most traditionally spy-like of the book. In the Pacific, Purple decrypts yielded little due to radio silence. In the Atlantic Enigma was eventually being decrypted in real time. Yet such was due mostly to sloppiness on the part of certain branches (the newer branches like the Luftwaffe which did not have the benefit of any tradition, let alone one of strict and tested procedures and special schooling.) In contrast the Kreigsmarine was an older service and observed in its use of cryptography sensible and tested protocols including 1) training to avoid particular types of mistakes, 2) operating on the premise that the enemy was listening, 3) using as few transmissions as possible, and 4) constantly reviewing the security of the system. Unfortunately such methods were undone undone by the fact that the U-boat operators did not even both using Enigma's fourth rotator and many reports were re-broadcasted unencrypted or weakly encrypted by shore stations. Again though, Keegan suggests it was not that the Bletchley Park code-breakers steered the convoys away from Dönitz's wolf-pack traps but a host of factors which led to the failure of the German U-boat war in the Atlantic and the triumph of the British merchant fleet. Among those factors were that Dönitz never secured funding to create the numbers of boats he needed to conduct his campaign, too he did not vary his techniques and tactics. Also, while the German torpedoes had improved, the U-boats still relied on Nelsonian line of sight to acquire their targets. Too the open environment of the British government with its "need-to-know" was more fruitful than the secrecy in the German hierarchy. Ultimately, though, Keegan credits the merchantmen's perseverance with the victory. V2 on Meillerwagen mobile platform. As is now probably rather clear, intelligence is but one of many factors in warfare. Keegan's discussion of the American and British code-breaking camps is as exciting as the battles but it won't do to recount it in detail. His observations as to the differences in their environments and styles are most perceptive. Keegan also sheds light on the great Polish achievement of breaking the Enigma purely by mathematics. Only someone with his range of knowledge could make the observation, among others, that Saddam Hussein's SCUD missiles would be hard, if not impossible to find, because their carriers were based on the design of the German mobile launching platform for the V2, the Meillerwagen. The Meillerwagen was a brilliantly simple, inexpensive, and inconspicuous mobile platform which could be rolled out into a street to launch a rocket within an hour. Keegan himself is a master of weighing alternatives and in presenting his copious array of facts he shows us what seems most likely worked in someone's favor and what appears more consequential than it was. He concludes with a few more cautions about intelligence. First we tend to overestimate its usefulness because we confuse it with espionage and intermingle it with subversion. Too we confuse intelligence with resistance. Second, we ignore structural and institutional factors. For example, few intelligence officers spend a lifetime in intelligence as many transfer to operations so they can become master rather than servant. How then can we expect experts? Third, we tend to overlook human factors like an individual's training, his experiences, personal tendencies. We tend to see scientists as rational automatons who couldn't possibly be pig-headed and stubborn like Lord Cherwell, who had the mathematics on his side as far as English scientists knew. We tend to see incompetence or corruption where there might be more subtle human failings. The "Cambridge Spies" were shuffled around despite their terribly poor personal behavior due to the permissiveness of their superiors, the "indulgence of the well-behaved for the naughty," which they hoped would free them from charges of pomposity and stuffiness. [Keegan, 337] Churchill expected his Special Operations to sow the seeds of dissent in Nazi Europe. He expected his German opponents to be gentleman like the Boers he fought years ago. He realized niether the degree to which the overturning of German culture, currency, and monarchy had left the people prey to the self-righteousness of the Nazi party nor the degree to which the Nazis would bring down vicious cruelty on those who threatened it. Lastly, we have fallen prey to the myth that somehow special or intelligence operations are as effective, more deadly, and cheaper than fighting and winning wars. There are no simple, cheap, and guaranteed paths to victory. In fact, even with intelligence, even with intelligence and numbers in your advantage, you're not guaranteed. . . well, anything. It wasn't the intelligence that won, but the ferocity of the British fleet, it was the Confederate troops who marched barefoot, the frenzied German paratroopers, and the relentless British merchantmen that won the day. The tenacity of a commander, wise speculation and covert deployment, timing and luck all play their part. Intelligence is often necessary but never sufficient, and certainly never a substitute for the will to win. Intelligence in War is indeed meticulously researched and this virtue lends further credence to Keegan's thesis. No one could accuse him of cherry-picking his facts. He really does seem to delve into every conceivable aspect of a situation. From capabilities of individual ships to expenses to miles of cable laid to letters and documents, this books is painstakingly researched. It is also copiously referenced with footnotes to works famous and obscure for those looking to do additional reading outside the bibliography. In fact, Intelligence in War might make a good jumping-off point to a number of classic works Keegan references, from Tanner's Stonewall in the Valley to Hinsley's British Intelligence in the Second World War and Bennet's Ultra and Mediterranean Strategy. Keegan's maxims and general observations about warfare formed from the lessons in these case studies are, finally, the essence of the book. This is, I think, what most accounts for the sweep of Intelligence in War. Even more than the daring escapades and vast landscapes it is the fact that Keegan is talking not just about battles but about battle that gives Intelligence in War its scope. Too, though, his caution about judging with hindsight and his willingness to ask of a leader what he reasonably could have been expected to do in situation with what he had at his disposal gives Keegan's writing a rare sapient quality. This also serves to humanize all the leaders in the book, making commanders like Nelson and Jackson who succeeded against great odds and their own mistakes seem all the larger, and commanders like Cradock and Nagumo seem crippled by their limitations and swallowed by their circumstances. Yet Keegan's thesis is ultimately not a glorification of Great Leaders of History, but an admission that it is the guts of the men on the ground that win the battles. One regret is perhaps inevitable: with detail of this magnitude only some case studies will make the final version of the book. Keegan includes about a dozen major case studies and persuades with them but surely he has notes on many more. I for one would like to see some of them in a second volume. Updated: 4/29/11: Results of WWI German cruiser campaign. Keegan, John. Intelligence in War: The Value–and Limitations–About What the Military Can Learn From the Enemy. Random House. London. 2002.